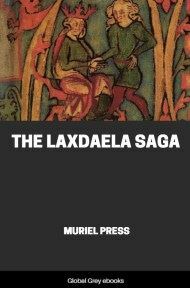 This is a collection of 52 folk-tales including; The Two Friends Who Set Off To Travel Round The World; The Coming Of Men, A Long, Long While Ago; Nukúnguasik, Who Escaped From The Tupilak; Qujâvârssuk; Kúnigseq; The Woman Who Had A Bear As A Foster-Son; Ímarasugssuaq, Who Ate His Wives; Qalagánguasê, Who Passed To The Land Of Ghosts; Isigâligârssik, and more. 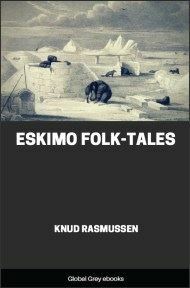 These stories were collected in various parts of Greenland, taken down from the lips of the Eskimo story-tellers themselves, by Knud Rasmussen, the Danish explorer. No man is better qualified to tell the story of Greenland, or the stories of its people. Knud Rasmussen is himself partly of Eskimo origin; his childhood was spent in Greenland, and to Greenland he returned again and again, studying, exploring, crossing the desert of the inland ice, making unique collections of material, tangible and otherwise, from all parts of that vast and little-known land, and his achievements on these various expeditions have gained for him much honour and the appreciation of many learned societies. But it is as an interpreter of native life, of the ways and customs of the Eskimos, that he has done his greatest work. “Kunúnguaq”—that is his native name—is known throughout the country and possesses the confidence of the natives to a superlative degree, forming himself, as it were, a link between them and the rest of the world. Such work, as regards its hither side, must naturally consist to a great extent of scientific treatises, collections of facts and specimens, all requiring previous knowledge of the subject for their proper comprehension. These have their great value as additions to the sum of human knowledge, but they remain unknown to the majority of men. The present volume is designed to be essentially a popular, as distinct from a scientific work. 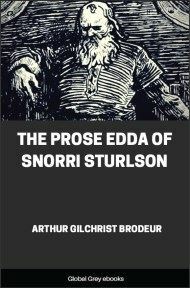 The original collection of stories and legends made by Knud Rasmussen under the auspices of the Carlsberg Foundation has never yet been published. In making the present selection, I have endeavoured to choose those which are most characteristic and best calculated to give an idea of the life and thought of the people. The clearest variants have been chosen, and vague or doubtful passages omitted, so as to render the narratives easily understandable for the ordinary reader. In many cases also, the extreme outspokenness of the primitive people concerned has necessitated further editing, in respect of which, I can confidently refer any inclined to protest, to the unabridged English version, lodged with the Trustees of the Carlsberg Foundation in Copenhagen, for my defence. 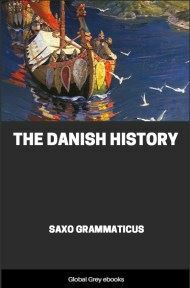 For the rest, I have endeavoured to keep as closely as possible to the spirit and tone of the originals, working from the Eskimo text and Knud Rasmussen’s Danish version side by side. The illustrations are by native Eskimo artists. 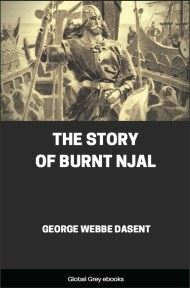 They are not drawn to illustrate the particular stories, but represent typical scenes and incidents such as are there described. 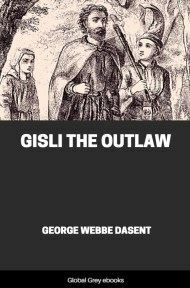 In the selection of these, preference has been given to those of unusual character, as for instance those dealing with the “tupilak” theme, and matters of wizardry or superstition generally, which the reader would find more difficult to visualize for himself than ordinary scenes of daily life. 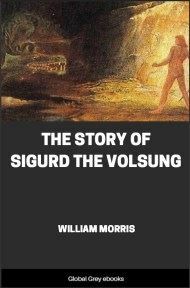 As regards their contents, the stories bring before us, more clearly, perhaps, than any objective study, the daily life of the Eskimos, their habit of thought, their conception of the universe, and the curious “spirit world” which forms their primitive religion or mythology. In point of form they are unique. The aim of the Eskimo story-teller is to pass the time during the long hours of darkness; if he can send his hearers to sleep, he achieves a triumph. Not infrequently a story-teller will introduce his chef-d’œuvre with the proud declaration that “no one has ever heard this story to the end.” The telling of the story thus becomes a kind of contest between his power of sustained invention and detailed embroidery on the one hand and his hearers’ power of endurance on the other. Nevertheless, the stories are not as interminable as might be expected; we find also long and short variants of the same theme. In the present selection, versions of reasonable length have been preferred. The themes themselves are, of course, capable of almost infinite expansion. In the technique of an ordinary novel there is a certain balance, or just proportion, between the amount of space devoted to the various items, scenes and episodes. The ordinary reader does not notice it as a rule, for the simple reason that it is always there. The Eskimo stories are magnificently heedless of such proportion. Any detail, whether of fact or fancy, can be expanded at will; a journey of many hundred miles may be summarized in a dozen words: “Then he went away to the Northward, and came to a place.” Thus with the little story of the Man who went out to search for his Son; the version here employed covers no more than a few pages, yet it is a record of six distinct adventures, threaded on to the main theme of the search. It is thus a parallel in brief to the “Wandering” stories popular in Europe in the Middle Ages, when any kind of journey served as the string on which to gather all sorts of anecdote and adventure. The story of Atungait, who goes on a journey and meets with lame people, left-handed people, and the like, is an example of another well-known classical and mediæval type. The mythical stories present some interesting features when compared with the beliefs and folk-lore of other peoples. The legend of the Men who travelled round the World is based on a conception of the world as round. There is the tradition of a deluge, but here supported by geological evidence which is appreciated by the natives themselves: i.e. the finding of mussel shells on the hills far inland. The principle of the tides is recognized in what is otherwise a fairy tale; “There will be no more ebb-tide or flood if you strangle me,” says the Moon Man to the Obstinate One. The constellation of the Great Bear is explained in one story, the origin of Venus in another. The spirits of the departed are “stellified” as seen in “The Coming of Men.” There seems to be a considerable intermingling of Christian culture and modern science in the general attitude towards life, but these foreign elements are coated over, as it were, like the speck of grit in an oyster, till they appear as concentrations of the native poetic spirit that forms their environment.